Advanced QuickBooks Online users may want to configure our service manually. If you're familiar with QuickBooks Online and Amazon, then this is recommended route. 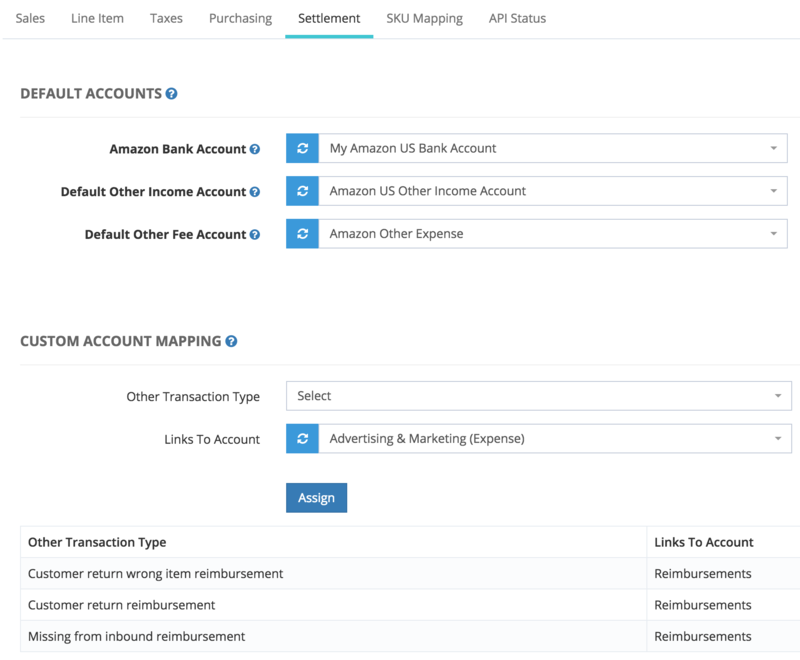 You can map Amazon transactions to accounts that you've already created or use our recommended setting to automatically create the proper service items and accounts. Then you can simply rename them in QuickBooks Online instead of making them manually. If you rename them, refresh SellerZen so that we can display the renamed account properly. 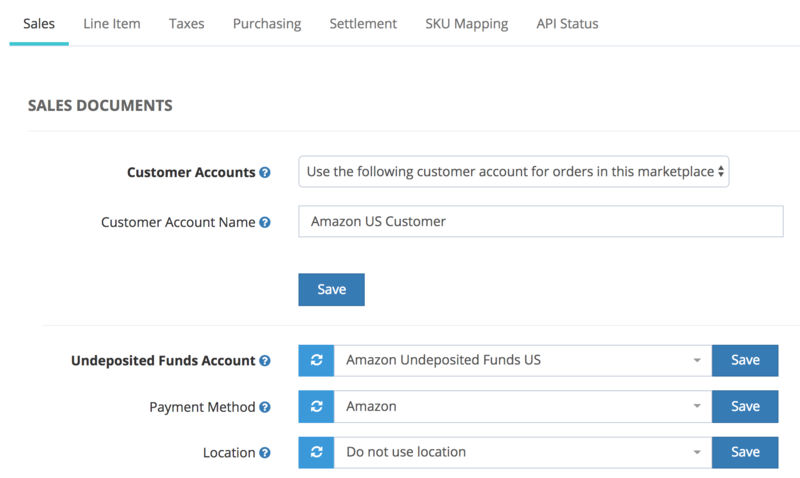 This section allows you to choose whether or not to use a default customer account and to choose the bank account for your Amazon undeposited funds account. You can also specify optional Location and Payment method here. 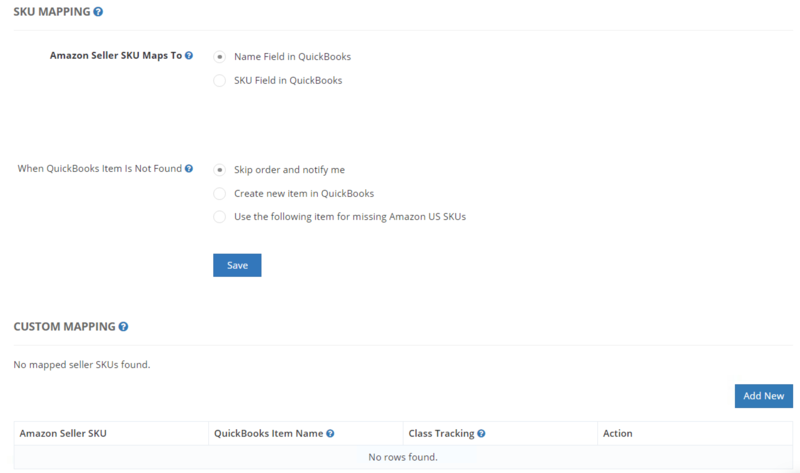 In this section, you'll map the most common Amazon order-related transactions to your QuickBooks Online services and accounts. The bolded fields are required. Create and name the QuickBooks Online Service under Sales > Products & Services and map them to the proper accounts under the "Income Account" field. You can choose either an income or expense account in this dropdown menu. 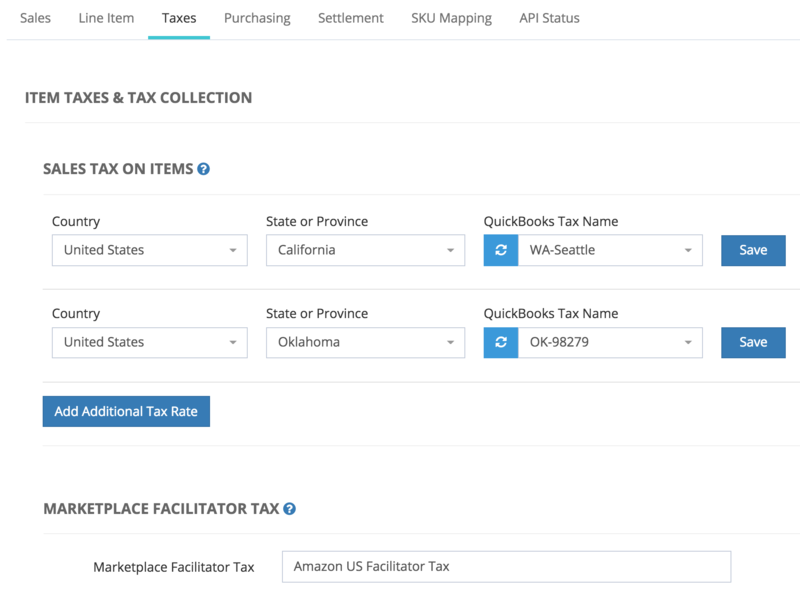 This section allows you to map Sales Tax to your QuickBooks Online taxes. 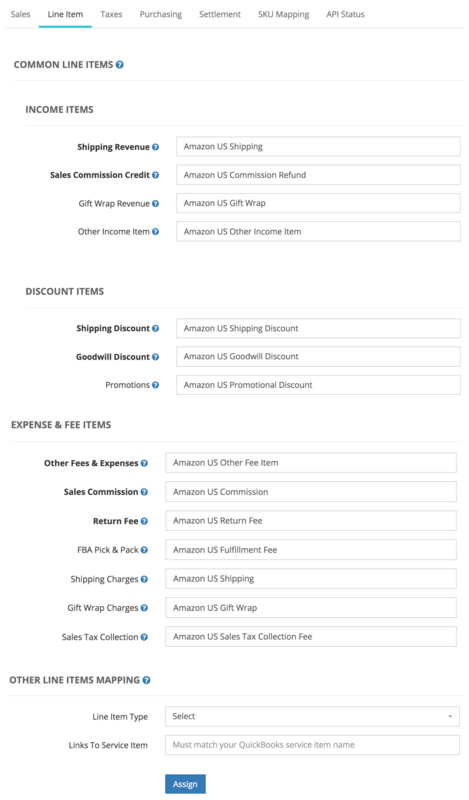 If you're FBA, you'll need to configure sales tax because Amazon collects sales tax on your behalf. Read here to see which states require Amazon to collect. 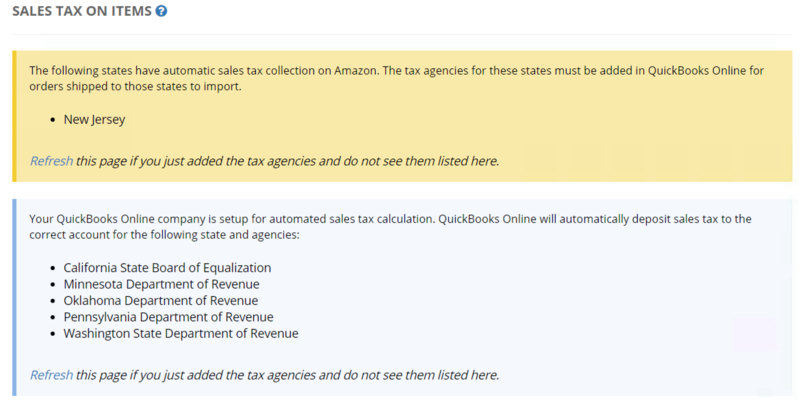 If you're on the older QuickBooks Online sales tax engine, you'll see this screen below. Click here to see how to create sales tax and map on SellerZen. New QuickBooks Online users will see the screen below. Simply add the tax agency in QuickBooks Online, and refresh the page on SellerZen. We'll automatically map the agencies. Set up your sales tax and Amazon's Marketplace Facilitator Tax here. You'll need to configure sales tax in QuickBooks Online before you can map it on SellerZen. This section allows you to configure vendor information. You don't have to create a new Accounts Payable (A/P) account here if you want to use the default QuickBooks Online account. This page allows you to choose the default income and expense account for non-order related transactions like storage fees. You can also map various Amazon transactions such as the Inbound transportation charge to specific accounts in QuickBooks Online. In this section, you can have SellerZen map your Amazon Seller SKU to either your Inventory Name or SKU field. We recommend the Name field because it's a unique identifier, whereas the SKU can be the same for multiple items. Choose how you want SellerZen to handle orders when the Inventory is not found in QuickBooks Online. By default, we'll Skip order and notify you when QuickBooks Online Inventory items are missing. You can also manually map your Amazon SKU to any QuickBooks Online Inventory Name. Or you can upload a CSV file. If you are uploading a file, then we highly recommend that you wait until we finish processing your files before you begin syncing. That way, we can sure that the proper QuickBooks Online documents are created. Click here if you have QuickBooks Online Simple Start or Essentials to see how to handle Inventory. This page has your Amazon API settings. You can update your MWS Auth Token here. There's no way to change the Start Date or Time unless you disconnect and reconnect, but we don't recommend you do this because you'll end up with duplicate documents. Please start a chat with us or email us at info@sellerzen.com if you want to change the date. You can also view what date and time you started to sync if you need to manually input orders up to our service start date. Once you've reviewed your settings and are confident with the account mappings, then all that is left do is click on "Start" so that we can verify that your settings are all valid. If there are no issues, then our service will begin to import your orders automatically.